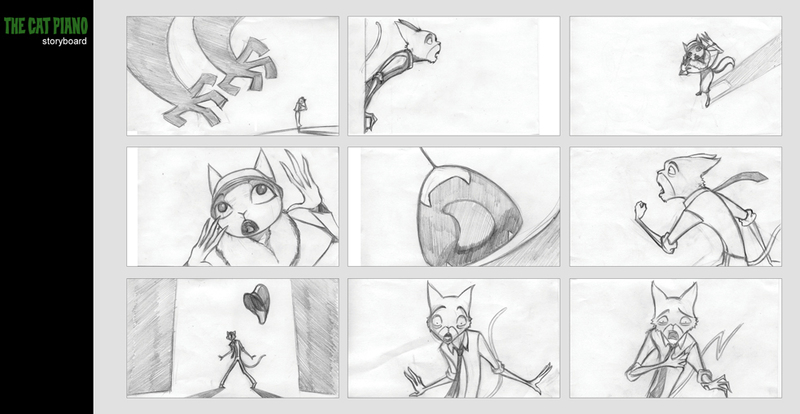 Well after some weeks of working on the storyboards for The Cat Piano, I am happy to say that we have completed them and have put some a few on here for you to see. Obviously we don’t want to put on so many that it gives the whole story away, so we’ve chosen a snippet of a selected scene. Ari has started on some tests for the animation and will start animating the film very soon. As soon as we have some pencil tests for you we will put them up on the blog. I will also be be able to announce who will narrate the film in the coming weeks. We hope to finish the film by early December. Jessica Brentnall, one of the film’s producers is organising a film showcase called PULSE, featuring emerging young Australian directors and so The Cat Piano will hopefully recieve its premiere at the Pulse screening on December 6th in Sydney, alongside films by young director’s such as Nash Edgerton, Garth Davis and Amiel Courtin-Wilson. The Pulse showcase is also going to travel to L.A and New York City in Jan next year which will be cool. I know it’s a bit late and all……but any chance of more story boards here? ?